Hundreds of Hungarians held a candle-lit vigil against a planned statue honouring a pro-Nazi minister. The protest in the city of Székesfehérvár this past Sunday included diplomats from the United States, Israel, Canada, and Washington’s special envoy on anti-Semitism Ira Forman. Bálint Hóman remains of Hungary’s most toxic reminders of its complicity in the Holocaust. He supported discriminatory policies that disposed Jews of land and denied them university jobs in the 1930s. He advocated a close alliance with Nazi Germany. And supported policies that resulted in the deportation and murder of more than 500,000 Jews. Székesfehérvár’s mayor, András Cser-Palkovic, a member of the ruling Fidesz party, will ask the Hóman Foundation to reconsider its planned installation. Fidesz has already donated Ft15m ($52,000) to the project. The Hóman Foundation hope to unveil the statue on December 29 – the 130th anniversary of Hóman’s birth. 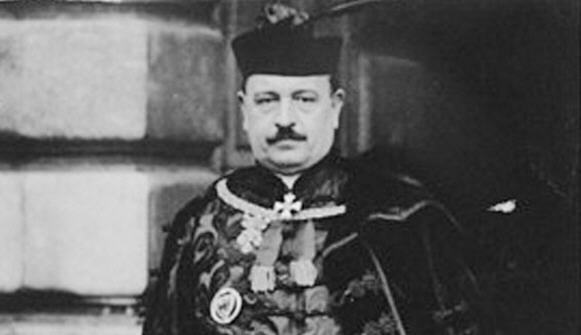 Hungary’s close ties to Nazi Germany began before the onset of war. In 1938, the Nazis annexed Sudeten region of the now Czech Republic. Hungary gained territory from this action. That same year, Hungary passed laws that cut Jewish employment by 80 per cent. A year later, and Hungarian laws racialised Jews. Against this backdrop, the Nazis rewarded had Hungary with northern Transylvania. With the onset of war, Hungary passed a law that drafted Jewish man between the age of 28 and 40 in labour service units. They found themselves working in construction, mining, and building military fortifications. Antisemitism, however, remained rife. Thousands of Jewish labourers died from abuse, malnourishment, cold, and disease. Those caught retreating were burnt alive or murdered by Hungarian guards. By 1941, the fascist Arrow Cross regime passed laws that officially defined Jewishness. In July of that year, Hungarian forces rounded up Jews with Soviet or Polish citizenship for deportation. Hungarian Jews who could not prove their citizenship also faced deportation. Thousands faced a death march to Kamenets-Podolski. Of the 23,600 murdered, roughly 14,000 to 16,000 were from Hungary. In 1944, Bálint Hóman joined 29 other MPs in signing a document calling for the complete expulsion of Hungarian Jews. The Nazi invasion of Hungary in March 1944 brought greater cooperation. Across Hungary, Jewish communities either had to live outside or in ghettos. Many ghettos only existed for a matter of weeks or days before liquidation. It took Hungarian forces in coordination with German Security Police less than two months to deport nearly 440,000 Jews in more than 145 trains. Many of the deported ended up in Auschwitz. Some dug fortifications along the Austrian border. As 1944 drew to a close, the only Jewish community left in Hungary resided in Budapest. Bálint Hóman received a life sentence from the post-war Communist regime after voting to support the war against the Soviet Union. He died in prison in 1951. The Federation of Hungarian Jewish Communities (MAZSIHISZ) estimate that Hungary’s Jewish population today totals above 120,000. In 2014, Hungary made its first official apology for its role in the Holocaust. Its ambassador to the UN, Csaba Korosi, said ‘We owe an apology to the victims because the Hungarian state was guilty for the Holocaust’. On 9 March 2015 Hungary assumed the Chairmanship of the International Holocaust Remembrance Alliance. The furore reflects Hungary’s own struggle to reconcile its role in the Holocaust. Prime Minister Vicktor Orban has made public overtures to stamp out growing antisemitism. His biggest political rival is the far-right Jobbik. A party that continues to make political gains from historical and contemporary prejudices. Orban’s anti-Muslim rhetoric followed a growing concern in other parts of Europe about the resettlement of migrants and refugees. His party militarised its borders and acknowledges that human rights are ‘secondary‘.